We are a leading Manufacturer of sensocon diff. pressure switch (adps) and dwyer diff. pressure switch (adps) from Ahmedabad, India. The Series 104 Differential Pressure Switch is a low-cost easy to use differential pressure switch for very low pressure applications. The differential pressure switch can monitor positive, negative, or differential pressure and with an easy to adjust set point knob makes field set up and adjustment hassle free. 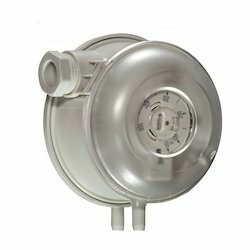 The differential pressure switch includes a SPDT relay rated for2A @ 250V and can be set as low as 0.08" w.c. (20 Pa). Switch Type Single-pole double-throw (SPDT). Max Switching rate 6 cycles/min. Weight 5.6 oz (160 g). Enclosure Rating NEMA 13, IP54. The Series ADPS Adjustable Dwyer Diff. Pressure Switch (ADPS) is designed for pressure, vacuum, and differential pressures. The dual scaled adjustment knob in inches water column and pascals allows changes to the switching pressure to be made without a pressure gage. The ADPS is available with settings from 0.08 w.c. (20 Pa) up to 16 w.c. (4000 Pa). The silicone diaphragm and PA 6.6 body make the series ADPS ideal for use with air and other noncombustible gases. The compact size, adjustment knob and low cost make the ADPS the perfect choice for H.V.A.C. applications. Push-on screw terminals. M20x1.5 with cable strain relief or optional 1/2 NPT connection. silicone; Housing material POM switch body PA 6.6; Cover Polystyrene.